Aim: This study was designed for isolating and characterizing antiplasmodial compounds from marine octocoral-associated bacteria. Materials and Methods: The organic extract of the Bacillus sp. was subjected to purification using several chromatography techniques guided by bioassays to yield three isocoumarin derivatives (1-3). Chemical structures of the compounds were elucidated on the basis of HRMS spectra and NMR spectroscopy. The antiplasmodial activity of the isolated compounds was evaluated in vitro against the chloroquine-resistant Plasmodium falciparum strain W2. Results: Isolated compounds were identified as bacilosarcin A (1), AI77-F (2), and AI77-H (3). Bacilosarcin A (1) displayed a low micromolar activity (IC 50 = 2.2 μM) against P. falciparum while compounds 2 and 3 showed no activity. Conclusions: Bacilosarcin A was found to be responsible for the antiplasmodial activity observed in the crude extract obtained from the Bacillus sp. Efforts to develop an effective vaccine to prevent malaria have not been successful, despite the fact that several vaccine candidates have reached phase I-II, and even phase III clinical trials. , Additionally, the development of drug resistance by malaria parasites creates a more complex scenario for the treatment of this disease. , Given this situation, there is an urgent need for finding new antimalarial compounds with new mechanisms of action. As a part of our drug discovery program on marine organisms, we are exploring the diversity of bacteria associated with Panamanian marine invertebrates as sources for new bioactive compounds. With this goal, crude extracts and fractions from marine bacteria were screened in a panel of assays against cancer and neglected tropical diseases including malaria, Chagas' disease, and leishmaniasis. Herein we report the antiplasmodial activity of bacilosarcin A (1), an isocoumarin derivative isolated from the extract of the bacterium Bacillus sp. associated with the octocoral Leptogorgia alba. Optical rotations were measured with a Jasco P-2000 polarimeter. NMR spectra were acquired on Jeol Eclipse 400 MHz and Bruker Avance 600 MHz spectrometers and referenced to residual solvent 1 H and 13 C signals (δH 7.26, δC 77.0 for CDCl 3 ; and δH 2.50, δC 39.5 for DMSO-d6 ). Low-resolution ESIMS spectra were acquired on Jeol LC-mate mass spectrometer, while high-accuracy mass measurements were obtained on Agilent 6230 mass spectrometer. The purification of the compounds was carried out on Agilent 1200 HPLC system equipped with a quaternary pump, a diode array detector, and a normal phase silica gel column (Phenomenex Sphereclone, 4.6 mm × 100 mm, 5 μm) at a flow rate of 1 mL/min. The octocoral L. alba was hand collected using SCUBA at 10 m near Otoque Island, located on the Pacific Ocean side off the coast of Panama in August 2009. A piece of the coral was rinsed with autoclaved seawater to remove loosely attached bacteria, and a small portion (0.5 mL) of the coral mucus was inoculated directly on agar plates with the seawater-based nutrient medium (8 g of Noble agar, 500 mg of mannitol, 100 mg of peptone, rifampicin [5 μg/mL] in 1 L of natural sea water). Agar plates were taken to the laboratory and observed for bacterial isolation, at room temperature over a period of 1 month. Strain GL0033 was further isolated from the collection plate and successively replated until a pure strain was obtained. The coral specimen was identified as L. alba based on its morphology and SEM micrographs of the coral sclerites following Breedy and Guzman. The taxonomic identification of bacterial strain GL0033 was carried out using PCR amplification and 16 S rRNA gene sequencing. The NCBI BLAST search for the GL0033 sequence indicated that this strain was 100% similar to Bacillus sp. Reference specimens of the coral (GLOT-120209-02) and the bacterial strain (GL0033) are deposited at INDICASAT's CEDD. Bacterium GL0033 was inoculated in six 2 L Erlenmeyer flasks, each containing 1 L of the culture broth (4 g of peptone, 2 g of the yeast extract, and 2 mL of glycerol in 1 L of natural seawater). Twenty grams of sterile Amberlite® XAD-16 resin was added to each Erlenmeyer flask with the culture medium. After 10 days of cultivation at room temperature (20°C) at 172 rpm, the resin was filtered, washed with deionized water, and eluted with methanol. The culture medium (6 L) was extracted with EtOAc (3 × 6 L). The organic extracts were combined and the solvents were removed under reduced pressure to yield 3.4 g of the crude extract. The crude extract (3.0 g) was fractionated using reverse phase C-18 solid phase extraction (SPE) cartridges, eluted with a step gradient of 20%, 40%, 60%, 80%, and 100% MeOH in water. The MeOH/water 60:40 SPE fraction showed 84% growth inhibition of the P. falciparum. The fraction was then subjected to HPLC purification on a normal phase silica gel column (Phenomenex Sphereclone, 250 × 4.5 mm, 1 mL/min) using the isocratic elution of 7:3 EtOAc/hexanes, over 70 mins to yield 0.8 mg of bacilosarcin A (1), 0.7 mg of AI77-F (2), and 0.8 mg of AI77-H (3). Bacilosarcin A (1): White amorphous powder, [α] 25 D 24.5 (c 0.5, CHCl 3 ); 1 H NMR (400 MHz, CDCl 3 ) δ 10.68 (1H, bs, OH), 7.42 (1H, dd, J = 8.2, 7.5 Hz, H-6), 6.94 (1H, d, J = 9.9 Hz, H-6'), 6.89 (1H, d, J = 8.2 Hz, H-7), 6.70 (1H, d, J = 7.5 Hz, H-5), 6.41 (1H, bs, NH), 4.59 (1H, dt, J = 13.1, 2.7 Hz, H-3), 4.39 (1H, m, H-5'), 4.09 (1H, dd, J = 9.9, 2.6 Hz, H-9'), 3.93 (1H, d, J = 9.9 Hz, H-8'), 3.50 (1H, dd, J = 7.0, 2.6 Hz, H-10'), 3.08 (1H, dd, J = 16.1, 13.1 Hz, H-4a), 2.84 (1H, dd, J = 16.1, 2.7 Hz, H-4b), 2.63 (1H, d, J = 17.9 Hz, H-11'a), 2.46 (1H, dd, J = 17.9, 7.0 Hz, H-11'b), 1.76 (1H, ddd, J = 13.8, 9.9, 4.9 Hz, H-4'a), 1.66 (1H, m, H-3'), 1.44 (ddd, J = 13.8, 9.1, 4.8 Hz, H-4'b), 1.34 (3H, s, H-13'), 1.30 (3H, s, H-16'), 0.97(3H, d, J = 6.4 Hz, H-2'), 0.95 (3H, d, J = 6.3 Hz, H-1'); 13 C NMR (100 MHz, CDCl 3 ) δ ppm 172.3 (C, C-7'), 171.3 (C, C-12'), 169.7 (C, C-1), 162.1 (C, C-8), 139.3 (C,C-10), 136.6 (CH, C-6), 118.2 (CH, C-5), 116.3 (CH, C-7), 108.1 (C, C-9), 98.0 (C, C-15'), 81.2 (CH, C-3), 72.5 (CH, C-9'), 69.7, (C, C-14'), 68.2 (CH, C-8'), 49.6 (CH, C-5'), 47.9 (CH,C-10'), 41.0 (CH 2 , C-4'), 30.5 (CH 2 , C-4), 30.3 (CH 2 , C-11'), 24.7 (CH, C-3'), 23.8 (CH 3 , C-16'), 23.1 (CH 3 , C-2'), 21.8 (CH 3 , C-1'), 21.3 (CH 3 , C-13'); HRESITOF-MS m/z 492.2338 [M + H] + (calculated for C 24 H 34 N 3 O 8 , 492.2340). AI77-F (2): White amorphous powder, [α] 25 D - 106.4 (c 0.2, CHCl 3 ); 1 H NMR (400 MHz, DMSO-d6) δ ppm 10.81 (1H, s, C8-OH), 7.83 (1H, d, J = 10.0, H-6'), 7.52 (1H, dd, J = 5.7, 1.1, H-10'), 7.50 (1H, t, J = 8.0 Hz, H-6), 6.86 (1H, d, J = 8.0, H-7), 6.84 (1H, d, J = 6.1 Hz, H-5), 6.28 (1H, dd, J = 5.7, 2.0, H-11'), 6.21 (1H, d, J = 6.0, C8'-OH), 5.36 (1H, dt, J = 3.8, 1.1, H-9'), 4.69 (1H, ddd, J = 8.9, 6.0, 4.2, H-3), 4.41 (1H, dd, J = 6.6, 3.8, H-8'), 4.17 (1H, ddd, J = 13.5, 10.0, 4.2, H-5'), 2.97 (2H, m, H-4), 1.69 (1H, m, H-4'-a), 1.58 (1H, m, H-3'), 1.31 (1H, ddd, J = 13.5, 10.0, 3.8, H-4'-b), 0.91 (3H, d, 6.6, H-2'), 0.84 (3H, d, 6.4, H-1'); 13 C NMR (100 MHz, DMSO-d6) δ ppm 172.7 (C, C-12'), 169.7 (C, C-1), 168.8 (C, C-7'), 160.81 (C, C-8), 154.5 (CH, C-10'), 140.2 (C, C-10), 136.3 (CH, C-6), 121.7 (CH, C-11'), 118.5 (CH, C-5), 115.3 (CH, C-7), 108.4 (C, C-9), 84.1 (CH, C-9'), 80.8 (CH, C-3), 70.6 (CH, C-8'), 48.3 (CH, C-5'), 38.8 (CH 2 , C-4'), 29.1 (CH 2 , C-4), 24.05 (CH, C-3'), 23.3(CH 3 , C2'), 21.3 (CH 3 , C-1'); HRESIFT-MS [M + Na]+ m/z 412.1365 (calculated for C 20 H 23 NO 7 Na, 412.1367). AI77-H (3): White amorphous powder, [α] 25 D - 33 (c 0.2, CHCl 3 ); 1 H NMR (600 MHz, CDCl 3 ) δ ppm 10.76 (1H, s, C8-OH), 7.66 (1H, d, J = 5.1 Hz, H-10'), 7.41 (1H, t, J = 7.9 Hz, H-6), 6.88 (1H, m, H-7), 6.87 (1H, m, H-6'), 6.69 (d, J = 7.9 Hz, H-5), 6.19 (1H, d, J = 5.1 Hz, H-11'), 5.30 (1H, d, J = 5.1 Hz, H-9'), 4.60 (1H, d, J = 13.6 Hz, H-3), 4.37 (1H, m, H-5'), 4.30 (1H, d, J = 5.2 Hz, H-8'), 3.02 (1H, dd, J = 16.1, 13.6 Hz, H-4a), 2.84 (1H, dd, J = 16.1, 2.6 Hz, H-4b), 1.83 (1H, m, H-4'a), 1.69 (1H, m, H-3'), 1.47 (1H, ddd, J = 13.8, 9.2, 4.6 Hz, H-4'b), 0.97 (3H, d, J = 6.6 Hz, H-2'), 0.95 (3H, d, J = 6.1 Hz, H-1'); 13 C NMR (100 MHz, CDCl 3 ) δ ppm 171.9 (C, C-12'), 169.4 (C, C-1), 168.9 (C, C-7'), 162.2 (C, C-8), 153.4 (CH, C-10'), 139.1 (C, C-10), 136.5 (CH, C-6), 122.9 (CH, C-11'), 118.2 (CH, C-5), 116.3 (CH, C-7), 108.0 (C, C-9), 83.3 (CH, C-9'), 80.8 (CH, C-3), 72.0 (CH,C-8'), 49.4 (CH,C-5'), 40.5 (CH 2 , C-4'), 30.3 (CH 2 , C-4), 24.7 (CH, C-3'), 23.0 (CH 3 ,C-2'), 21.8 (CH 3 ,C-1'); HRESIMS [M + Na]+ m/z 412.1369 (calculated for C 20 H23 NO7 Na, 412.1367). The antiplasmodial activity was determined in a chloroquine-resistant P. falciparum strain (W2) utilizing a microfluorimetric assay to measure the inhibition of the parasite growth based on the detection of the parasitic DNA by intercalation with PicoGreen. P. falciparum was cultured according to the methods described by Trager and Jensen. The parasites were maintained in a 2% hematocrit on flat-bottomed flasks (75 mL) with the RPMI 1640 medium (Gibco-BRL) supplemented with 10% human serum. Cytotoxicity was measured in MCF-7 human breast cancer cells with the cell viability being determined by MTT reduction. Cells were seeded in 96-well plates at a rate of 6000 cells/well in 180 μL of the medium. After 24 h, the test chemicals were dissolved in DMSO and diluted in the medium without fetal bovine serum and then added to the plate at a rate of 20 μg/well. DMSO was less than 0.5% of the final concentration. After 48 h, the medium was removed and cell viability determined. The bacterial strain GL0033 was isolated from the octocoral L. alba collected near Otoque Island, Gulf of Panama, Pacific Panama. The bacterium was identified as Bacillus sp. based on its 16S rRNA sequence. The organic crude extract of strain GL0033 obtained from the culture broth showed a strong inhibition on the growing of chloroquine-resistant Plasmodium falciparum. The bioassay-guided fractionation of the extract using SPE fractionation followed by HPLC purification yielded compounds 1-3 [Figure 1]. Structures of 1-3 were identified as bacilosarcin A (1), , AI77-F (2),  and AI77-H (3),  on the basis of their spectroscopic data ( 1 H-NMR, 13 C-NMR, HRESITOF-MS, and optical rotations) and their comparison with spectroscopic data from the literature. Compounds 1-3 where evaluated for their activity against chloroquine-resistant P. falciparum [Table 1]. Bacilosarcin A (1) showed an IC50 value of 2.2 μM in the antiplasmodial assay, whereas compounds 1-2 did not show any activity [Table 1]. Compounds 1-3 possess the same 3,4-dihydro-8-hydroxy-isocoumarin moiety; however, bacilosarcin A (1) includes a 3-oxa-6,9-diazabicyclo[3.3.1]nonane ring system attached to carbon C-8', instead of the α-β-unsaturated butenolide ring present in compounds 2 and 3. From these structural features, we can infer that the heterobicyclic ring system attached to C-8' in bacilosarcin A is required for its antimalarial activity. Compounds 1-3 were also evaluated for their cytotoxicity using MCF-7 human breast cancer cell lines and showed no significant cytotoxic effect in this assay [Table 1]. This is the first report of the antiplasmodial activity of bacilosarcin A (1), which constitutes a new addition to the few existing antiplasmodial metabolites isolated from heterotrophic bacteria associated with corals. This finding confirms that bacteria associated with marine invertebrates represent a promising resource for antimalarial research. We gratefully acknowledge the Government of Panama (ANAM, ARAP) for granting permission to make these collections; to J. Ballesteros, J. Sánchez, and Dr. J. Martínez for the taxonomic identification of the bacterium; and to Dr. C. Spadafora for the malaria and cytotoxicity assays. This work was partially supported by the National Secretariat for Science and Technology of Panama (SENACYT, grant number COL08-061) and the Fogarty International Center's International Cooperative Biodiversity Groups program (grant number TW006634). 1. World Health Organization [http://www.who.int] World Malaria Report 2010. Available from: http://www.who.int/malaria/publications/atoz/9789241564106/en/index.html [Last accessed on 2011 July 17]. 2. Chilengi R. Clinical development of malaria vaccines: Should earlier trials be done in malaria endemic countries? Hum Vaccin 2009;5:627-36. 3. Sauerwein RW, Roestenberg M, Moorthy VS. Experimental human challenge infections can accelerate clinical malaria vaccine development. Nature Rev Immunol 2001;11:57-64. 4. Escalante AA, Smith DL, Kim Y. The dynamics of mutations associated with anti-malarial drug resistance in Plasmodium falciparum. Trends Parasitol 2009;25:557-63. 5. Cravo P, Culleton R, Afonso A, Ferreira ID, Rosario VE. Mechanisms of drug resistance in malaria: Current and new challenges. Antiinfect Agents Med Chem 2006;5:63-73. 6. Rodriguez LA, Henriques G, Borges ST, Hunt P, Sanchez CP, Martinelli A, et al. Experimental evolution of resistance to artemisinin combination therapy results in amplification of the mdr1 gene in a rodent malaria parasite. Plos One 2010;5:e11593. 7. Fattorusso E, Taglialatela-Scafati O. Marine antimalarials. Mar Drugs 2009;7:130-52. 8. Peach KC, Linington RG. New innovations for an old infection: Antimalarial lead discovery from marine natural products during the period 2003-2008. Future Med Chem 2009;1:593-617. 9. Gulder TA, Moore BS. Chasing the treasures of the sea-bacterial marine natural products. Curr Opin Microbiol 2009;12:252-60. 10. Williams PG. Panning for chemical gold: Marine bacteria as a source of new therapeutics. Trends Biotechnol 2008;27:45-52. 11. Prudhomme J, McDaniel E, Ponts N, Bertani S, Fenical W, Jensen P, et al. Marine actinomycetes: A new source of compounds against the human malaria parasite. Plos One 2008;3:e2335. 12. Breedy O, Guzman HM. A revision of the genus Leptogorgia Milne Edwards and Haime, 1857 (Coelenterata: Octocorallia: Gorgoniidae) in the eastern Pacific. Zootaxa 2007;1419:1-90. 13. Corbett Y, Herrera L, Gonzalez J, Cubilla L, Capson TL, Colley PD. et al. A novel DNA-based microfluorimetric method to evaluate antimalarial drug activity. Am J Trop Med Hyg 2004;70:119-24. 14. Trager W, Jensen JB. Human malaria parasites in continuous culture. Science 1976;193:673-5. 15. Manger RL, Leja LS, Lee SY, Hungerford JM, Hokama Y, Dickey RW, et al. Detection of sodium channel toxins: Directed cytotoxicity assays of purified ciguatoxins, brevetoxins, saxitoxins, and seafood extracts. J AOAC Int 1995;78:521-7. 16. Azumi M, Ogawa K, Fujita T, Takeshita M. Yoshida R, Furumai T, et al. 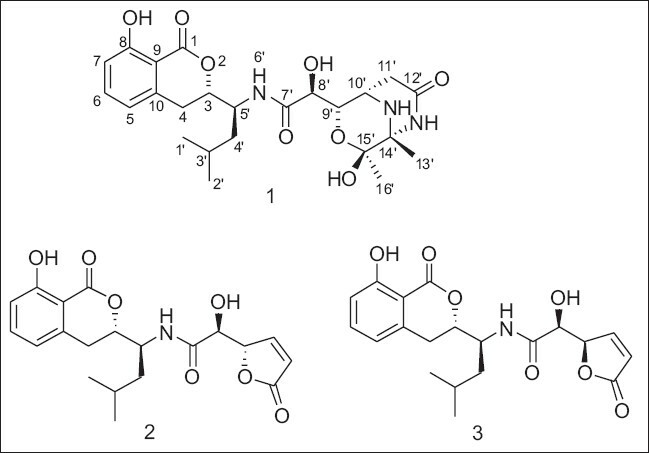 Bacilosarcins A and B, novel bioactive isocoumarins with unusual heterocyclic cores from the marine-derived bacterium Bacillus subtilis.Tetrahedron 2008;64:6420-5. 17. Enomoto M, Kuwahara S. Total synthesis of bacilosarcins A and B. Angew Chem Int Ed Engl 2009;48:1144-8. 18. Shimojima Y, Hayashi H, Ooka T, Shibukawa M, Iitaka Y. Studies on AI-77s, microbial products with gastroprotective activity. Structures and the chemical nature of AI-77s. Tetrahedron 1984;40:2519-27. Santiago Bastos, J.C. and Konecny Kohn, L. and Fantinatti-Garboggini, F. and Aiello Padilla, M. and Furtado Flores, E. and da Silva, B.P. and de Menezes, C.B.A. and Weis Arns, C.
MartÃ­nez-Luis, S. and GÃ³mez, J.F. and Spadafora, C. and GuzmÃ¡n, H.M. and GutiÃ©rrez, M.